FINCA EL ROMERO is a large Country house (Cortijo) with all the rooms wrapping around a central courtyard. The spacious accommodation, large pool and panoramic views makes this property a must for families wanting to enjoy privacy and comfort in the Spanish countryside. The property is reached via an unmade country lane (dirt track, which is 2 Kilometres from the local by-pass. Coin town centre is only a 10-minutes drive. 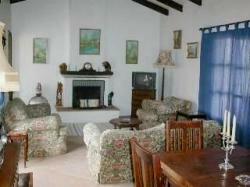 The property is fully furnished and totally self-contained. Eat Al Fresco with panoramic views. There is a spacious terrace and garden laid to grass with olive trees. Sunbathe anywhere around the grounds or in the area around the 8m x 4m swimming pool. The nearest towns are Coin and Alhaurin El Grande, which are about 10 and 15 minutes drive. Both Towns have lots of Supermarkets, Shops, Banks and also an Open-Air Market once a week.